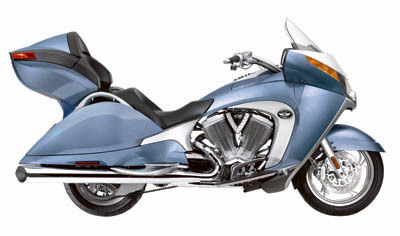 I had the opportunity to test drive both a 2009 Victory Vision and a 2010 Victory Cross Country. The following are my impressions. First, I am an avid Victory buff and have owned Victorys since 2000. I currently ride a sweet '03 Classic Cruiser that has been beefed up to 100ci along with other subtle motor enhancements by Lloydz Motorworks. It's also dressed and painted just the way I like and has even won awards at bike shows. It's been 3 years since the first Vision hit the streets and I wanted to see how/if there had been any improvements. I also wanted a 1-on-1 comparison to the Cross Country. Both of these bikes are on my radar for a future addition to my garage. My first demo of the day was the 2009 Vision Premium Tour, a striking metallic blue beauty. When the Vision was introduced in late 2007 (as 2008 models) owners' criticisms centered on misaligned hardbag lids and "soft" clearcoat that scratched easily. I can say that those initial issues have been resolved in the 2009 models. Fit & Finish on this Vision and the Cross Country are impeccable. Right out of the factory these bikes are beautiful. 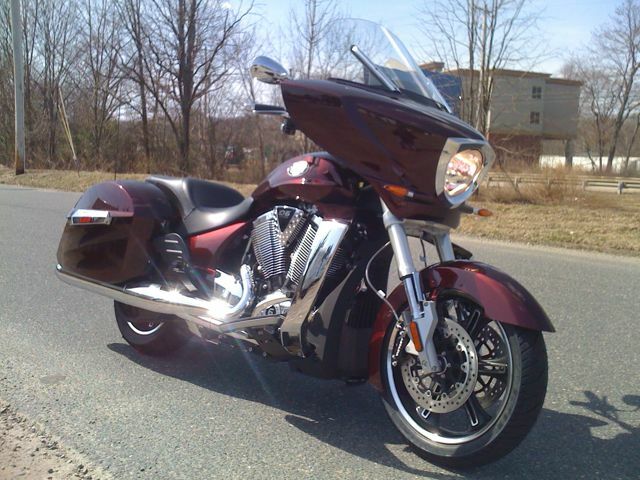 The paint quality of Victorys is so much higher than the other American motorcycle as to be a foolish comparison. The hardware and overall fit of the bikes exudes a quality-build mentality that supports Victory's claim (via J.D.Powers' polling) of a 95% Owner Satisfaction?the highest in the industry. The Vision felt bigger/heavier at a standstill compared to my 680lb cruiser but once underway, it revealed itself as very nimble and easy to maneuver. I felt comfortable with it within a mile from the dealership. It's low-speed handling surpassed EVERY bike I had ever ridden (Hondas, Kawis, Harleys, and yes, my '03 Victory) except for my Schwinn 10-speed. The Vision had the Stage 1/Level 1 exhaust & air filter upgrade but I didn't find its exhaust note overly loud. Having come from a brutish cruiser, the Vision felt slow from a stop but its 106ci muscle hit its torque range around 2.8k rpm and was quick from there on. With its incredibly low center of gravity, the bike stayed true and did not let wind bully it around. The combination of the extra thick seat padding and patented suspension (also used on the Cross-x bikes) provided a smooth but not mushy ride over typical Massachusetts crappy roads. Once I was super-confident with the bike, I started playing with its toys; electric windshield, cruise control, optional lower louvers, heated grips & seat, and radio. All worked flawlessly and while not completely intuitive, the electronics were mastered and committed to memory within a 5-minute stop. The radio for the Vision is still as unimpressive as it was in 2007. There have been numerous firmware upgrades to correct quirky issues with reception, sound quality and switching? all with success for a majority of owners. While the reception of this radio (in Boston's jam packed FM band) was fine, the sound quality wasn't. Despite adjustments to bass/treble, at speed the radio sounded like a cheap AM transistor radio from the 70's (ok I've just dated myself into obscurity). It's only on its sidestand that the bike's radio sounds marginally ok. The electric windshield is priceless. Being able to raise/lower it on a moments whim is just so sweet ? and practical. This proved to be a big advantage over the Cross Country. I saw no optical distortion in the shield as has been experienced in earlier models. 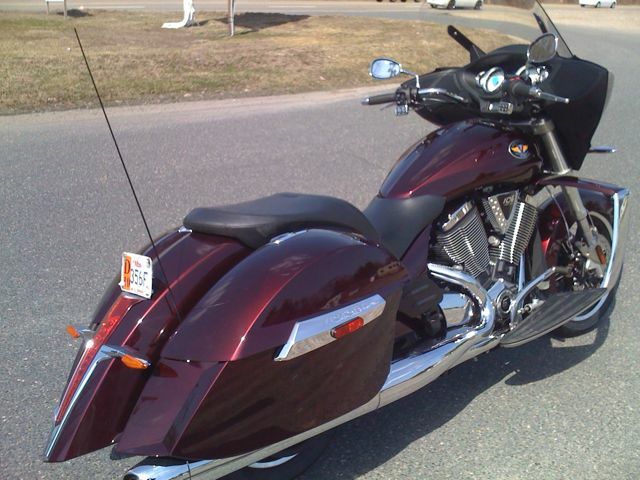 The optional lower louvers (wind deflectors) on this bike should be considered a mandatory option. This bike still suffers, in my opinion, from excessive heat on the legs. The louvers, redesign from their earlier ones, do a great job of directing cool air to rider's legs when needed. As I sat on the beautiful 2010 midnight cherry metallic Cross-Country, I realized the unintended fortune of test-driving the Vision first. It gave me a great feeling of spaciousness and protection that the Cross Country did not have. While this is a great (really!!) bike, I never noticed the space the Vision afforded until it was taken away on the Cross Country. That, and the electric windshield are the only things I missed on this bike. The handling of the CC is, like it's big brother, phenomenal. It is obviously lighter and you can feel that in its handling (good & bad). Bad in the sense that wind can have a greater effect on it track?the fork mounted fairing also plays a part in this. Wind buffeting is more noticeable on this bike than the Vision. That's not to say that the fairing doesn't do its job. Victory's extensive wind tunnel development time show off here. Wind from forward motion is dispatched evenly and provides a rather quiet air pocket for the rider. This particular bike had what seemed to be a taller than standard windscreen but I was never able to confirm this. The 106ci powerplant (same as the heavier Vision) propels this bike noticeably faster than the Vision. This particular bike also had the Stage1 upgrade and it was also noticeably quiet compared to Victory's other pipe upgrades. The radio (you can tell I'm an audio geek) is supposedly the same as the Vision but it sounds 10x better! The bass is far better and the clarity is fantastic. I can only attribute this to the speaker enclosures since the speakers are the same as well. Heated seat (driver only) & grips work well as does the cruise control. I was taken by the Cross-X bikes styling right from the start. It has classic but contemporary features that set it apart from competitors yet keep it in the same class of cruiser/touring. Unlike the Vision which broke all barriers in styling, the Cross Country (and Cross Road) remain in the realm of cruiser but push the envelope with certain styling elements such as angular fairing & light bezel, unique LED brake and turn signal cluster, massive bags, and far-out highway bar. The styling of these bikes is far more palatable for the HD defector yet still a stand out. For the rider looking for a cruiser with touring capabilities, this is the new gold standard. For me, I'm leaning toward the Vision because it is ALL touring but can compete with the cruiser market. I already have a great cruiser and just want the best I can get for long trips. If I were trading in my cruiser, that would be a different story, but I like it too much. There was a time (like 6 years ago) when being cool meant riding across country exposed to the elements, stuck in one position, and carrying just a change of clothes. It still has raw appeal, though not to anyone who has to stand next to you after the clothes take on a personality of their own! Maybe I've grown "old" but I like to think I've come to deserve more comforts while I ride long distances. Not to worry, I'll still take just a change of clothes.